The Gaza Strip has been under an illegal blockade for eleven years, and unemployment and poverty levels are at record highs. As a result, nearly one million of the 1.3 million Palestine refugees in Gaza rely on UNRWA food assistance to meet their basic daily needs. A $150 donation can provide enough flour, rice, whole milk, oil, chickpeas, lentils, and protein-rich sardines to feed a family for the summer. For the second year, UNRWA USA supporters chose to narrow the gap between the US and the Gaza Strip by bringing the thoughts, experiences, and struggles of Palestine refugee families into their homes and around their dining tables. Iftar for Gaza means feeding more than just those around the table; it's bringing together friends and family to ensure that Palestine refugees meet basic food needs through Ramadan and for the entire summer. UNRWA USA supporters hosted Iftar for Gaza events all across the country -- from picnics to potlucks to restaurant-catered dinners, Americans got creative to feed more than just those around their tables! This Ramadan, UNRWA USA supporters held 35 iftars across the United States, raising over $125,700, to provide UNRWA food assistance to more than 839 of the most vulnerable Palestine refugee families in the Gaza Strip. From New Jersey to California, New York to Texas, Maryland to Pennsylvania, these hosts and attendees showed Palestine refugees that Americans care and care deeply. Anika and Aamir took the idea of iftar for Gaza and got creative with it, flipping the concept and hosting a "sahoor for Gaza" party instead. Sahoor, the pre-dawn meal Muslims consume prior to fasting, takes place early in the morning, so the couple invited their friends and family to their home in Maryland and treated them to a huge late night party that started at 1 am and went on until 4 am, featuring a local chicken and waffle food truck, shawarma bowls and wraps from Georgetown's popular Muncheez restaurant, a barista serving up various coffees drinks, teas, and fresh fruit cocktails, and complimentary t-shirts. The generous couple not only hosted a sahoor to remember, they matched all donations made to their fundraising page. Together, Anika and Aamir's community provided enough funding to assist over 190 refugee families in the Gaza Strip! 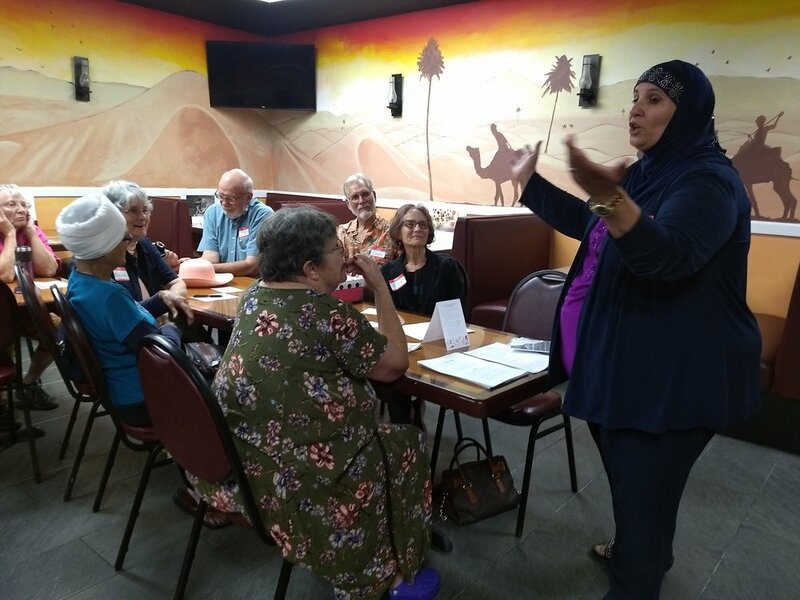 Longtime supporter Lora, along with 21 friends and neighbors, came together at Sahara Restaurant -- a local favorite -- for a delicious meal of basmati rice, falafel, hummus, dolmas, shawarma, and fattoush salad. 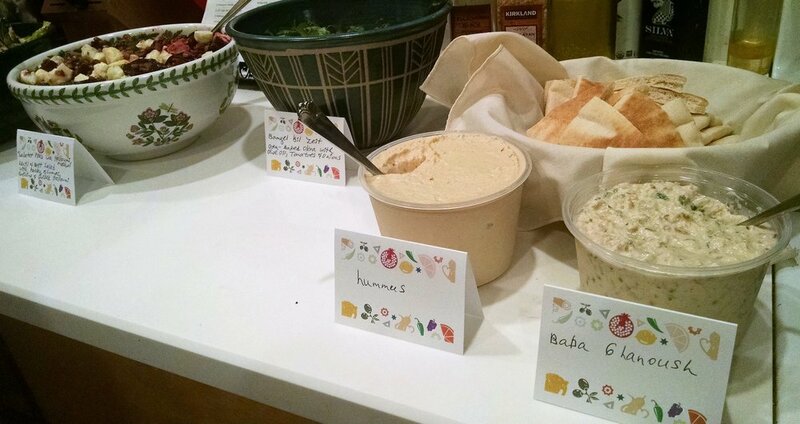 As they ate together, Lora reflected on her time in Gaza. She states in her blog piece encapsulating the event, "I had a flashback to many of the families in Gaza who served me wonderful meals — too numerous to count. I wish I could have bridged the miles and shared my Iftar with them." While she couldn't physically offer the same meals to families in Gaza, Lora's efforts, along with the efforts and generosity of her energetic and passionate community, amounted to 16 families receiving UNRWA food assistance for the entire summer! 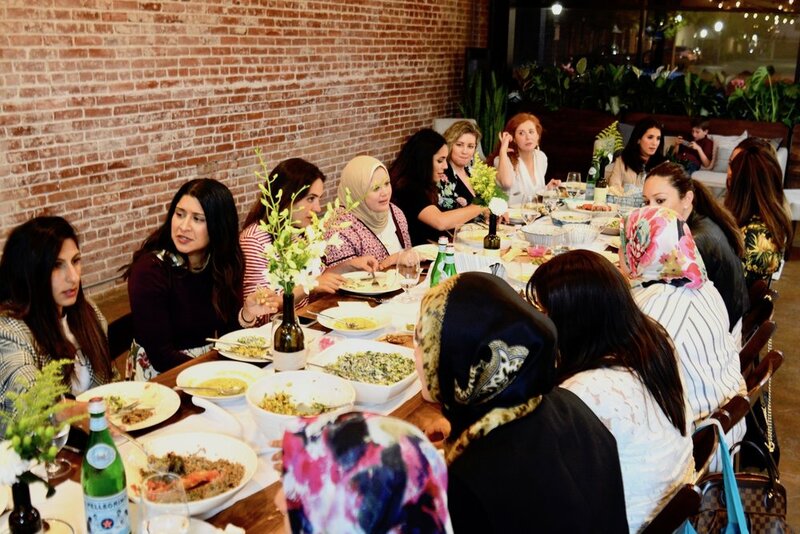 Two friends and entrepreneurs, Sara (A Little Bit of Lemon) and Lana (Olive & Heart), partnered together to host a Supper Club for Gaza in southern California featuring their favorite traditional Iraqi and Palestinian dishes alongside their close group of friends. One attendee encouraged her friends to attend and donate to their iftar event as a way to celebrate her birthday while also giving to charity. Lana reflected on the event in a recent Olive & Heart blog piece. 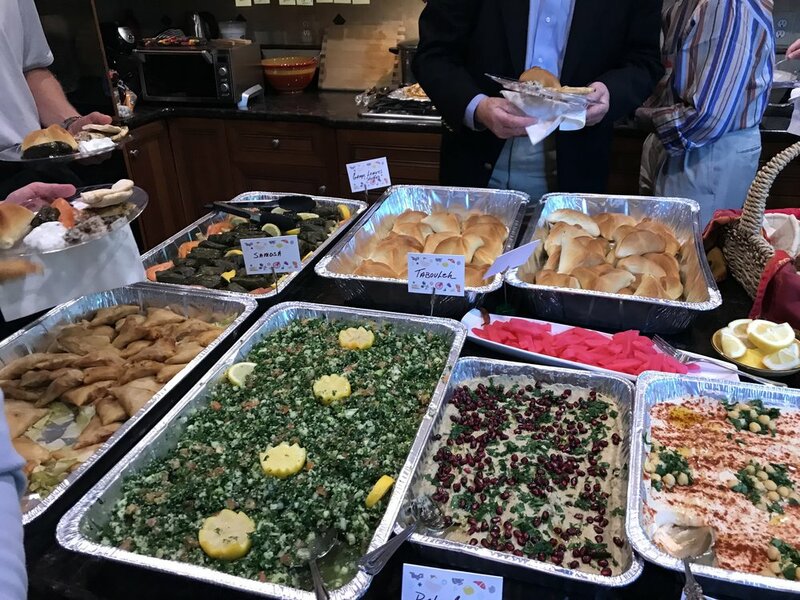 Our friends at Komeeda -- an organization that delivers creative cultural food experiences -- have been long-standing partners of our work assisting with the NYC Gaza 5Ks, hosting displaced dinners, and other outreach and fundraising events for Palestine refugees. 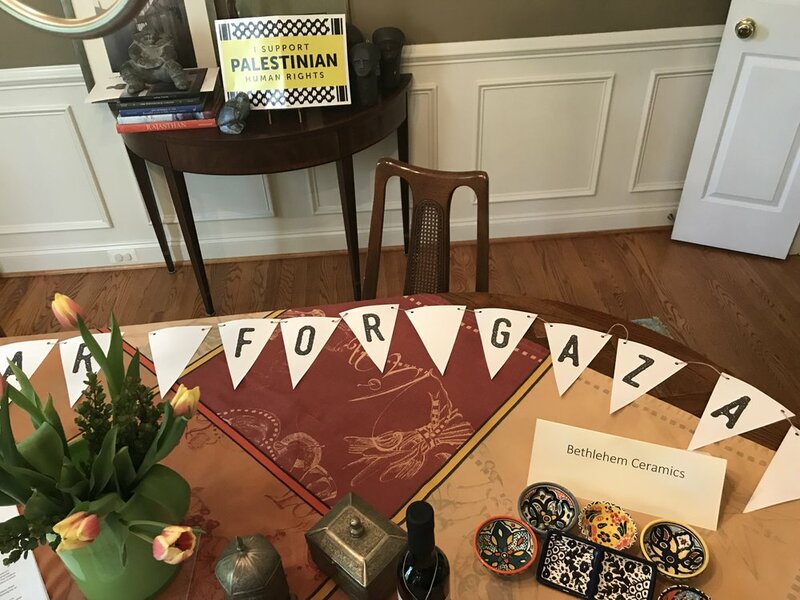 And for the second year in a row, they hosted a charitable iftar to benefit Palestine refugees in Gaza at the Food and Arts Center in downtown Manhattan. The tickets to the dinner along with donations made during and prior to the event contributed to 65 families in the Gaza Strip receiving UNRWA food assistance for Ramadan and the rest of summer. The event featured an impressive menu showcasing a molecular gastronomy interpretation of the Palestinian cuisine, including a lentil soup and basterma-wrapped dates, sous vide steak with cacao and Aleppo pepper, and halloumi cheese and blood oranges. 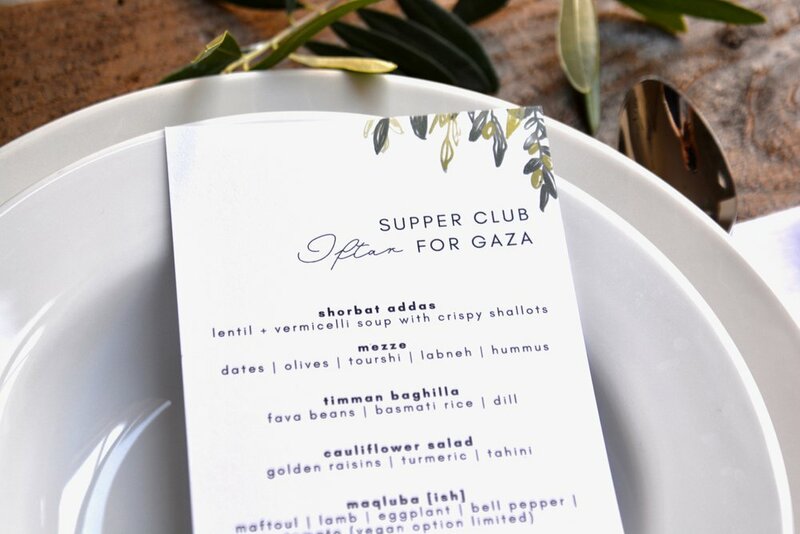 What's even more impressive than the menu, is their passionate community service and dedication to empowering refugees here in the United States and abroad. Sara and Dina co-hosted an iftar together, renting out Maggianos Restaurant and filling it with their closest friends and family for an elaborate and beautiful Italian dinner. Sara and Dina each pledged to feed ten families and invited their friends to join them in reaching their total goal. By the end of the night, they were able to collect enough to feed 51 families! Following the event, Sara and Dina continued to share their fundraising page on social media, and friends continued to donate, ultimately raising enough to feed over 58 families! Sara, a trained counselor, hopes to continue her efforts as a volunteer to strengthen UNRWA's Community Mental Health Programme in the Middle East. Ariella, Michelle, and a group of their friends came together for an intimate potluck dinner, hosted in their apartment in NYC. Together, they shared a meal and raised enough to feed four families in Gaza. Time after time, Googlers Zanoon and Rhonda have stepped up and taken initiative to support Palestine refugees. Most recently, they showed tremendous compassion and thoughtfulness during a time of exceptional need for refugees in Gaza by successfully mobilizing over 200 fellow Googlers to raise a staggering $38,000 for Palestine refugees in Gaza. In addition to hosting a huge dinner at Google, they shared a presentation highlighting UNRWA's work in the Gaza Strip and the impact of the UNRWA food assistance program with friends and colleagues who otherwise may not have known about UNRWA's critical work for Palestine refugees. In a cozy Brooklyn apartment, a group of friends from 8 different countries (along with a cute furry friend!) got together to break fast over a delicious meal, show solidarity with refugees in Gaza, and celebrate their friendships. In the process, they raised enough money to feed 7 Palestine refugee families in the Gaza Strip! High school students from Coney Island Prep have now hosted an iftar for Gaza two years in a row. This year, they made it even bigger and better, drawing students and teachers from all grades to participate and learn more about the situation facing refugees in the Gaza Strip. 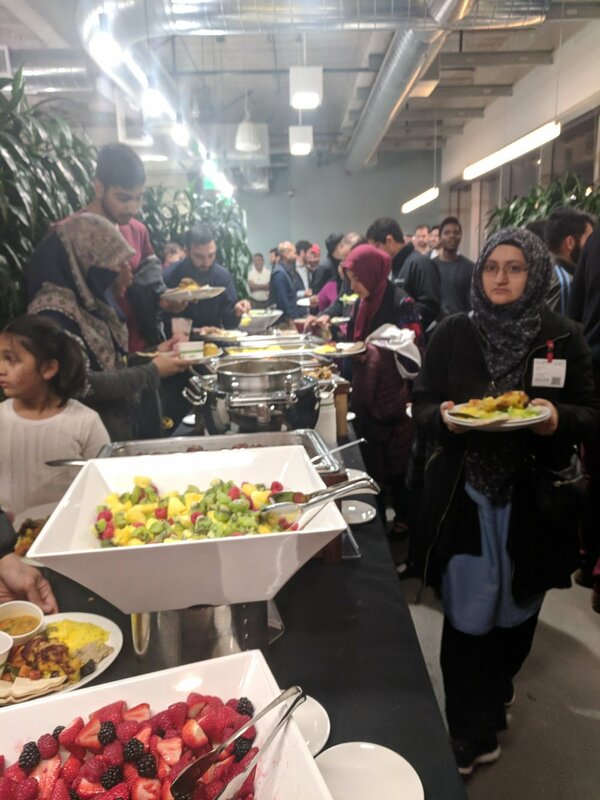 They hope to host another iftar next year, but until then, read about their successful iftar and what the event meant to them. Did you host an #IftarforGaza? Share your photos and videos with us via email or using hashtag #IftarforGaza so we can feature what you and your community achieved together! Thank you for keeping Gaza in your hearts and minds and for continuing to show Palestine refugees Americans care. In addition, UNRWA USA held two experiential and interactive charitable Iftar for Gaza events in the United States, where hundreds of supporters from the area attended to demonstrate solidarity and provide UNRWA food assistance to Palestine refugee families in the Gaza Strip. Check out photos from the recent New York City and Washington DC dinners. Created by the United Nations in the year 2000, World Refugee Day (June 20) is meant to raise awareness about refugees and the circumstances they face. Today, we are commemorating the strength, courage, and resilience of millions of refugees worldwide, including UNRWA's staff in the Gaza Strip, the West Bank (including East Jerusalem), Jordan, Lebanon, and Syria, who are the backbone of UNRWA. Something many people don't know about UNRWA is that unlike any other UN agency, UNRWA carries out all of its own work by a staff that is 99% Palestine refugees themselves. This means nearly all UNRWA's 30,000+ teachers, school principals, doctors, nurses, mental health counselors, engineers, relief and social workers, guards and administrative staff are refugees recruited locally to serve their fellow refugees. In places like Syria, where UNRWA serves half a million Palestine refugees, front-line humanitarian workers are risking their own lives to save others and alleviate the suffering of the most vulnerable. Dr. Sana’a Mahmoud Ayoub, a Palestine refugee from Yarmouk and UNRWA health worker, is one example. Like many others, Dr. Sana’a fled Yarmouk with her family when fighting escalated in December 2012. In spite of the difficulties of displacement and instability, she has never stopped assisting refugees in dire need of healthcare at the UNRWA Damascus Training Centre collective shelter in Syria. “My relationship with my patients goes beyond treating their pain; some like to share their journey and hardship. I listen to them and feel their sadness. Sometimes, the only treatment they need is words,” Dr. Sana’a adds. “Their stories are tainted with the violence they witnessed during the last five years. Their faces reveal strain and hopelessness, but you can still feel the strength and courage developed through the psychosocial support UNRWA provides them with,” she continues. The 40-year-old mother of four contributes her time, talent, and efficiency to the service of Palestine refugees in Syria. Her busy humanitarian work schedule keeps her at times from spending quality time with family and friends. Her energy and capabilities have made her more than a medical officer. She is known by refugees as the compassionate caretaker and friend. Despite all of the personal losses and the constraints faced on a daily basis, Dr. Sana'a and UNRWA staff continue to work with full dedication to support ongoing emergency operations and maintain high ethical standards while serving the Palestine refugees of Syria. Today, and every day, we honor, acknowledge, and thank Dr. Sana'a, her fellow UNRWA colleagues in Syria, and the more than 30,000 UNRWA refugee staff for their resilience and commitment to serving their Palestine refugee community across the Middle East. Mohammed Eid is a 28-year-old Palestine refugee, who has lived in Rafah camp in the Gaza Strip where UNRWA provides services for his entire life. Until recently, like most children in Gaza his age and younger, he has only known life in Gaza -- a small piece of land half the size of New York City. That's because due to 11 years of comprehensive air, sea, and land blockade and little to no freedom of movement, over 90% of children have never left the Strip. This changed for Mohammed when he received a prestigious Rotary Fellowship to pursue a master's degree in Global Studies and International Development through a joint program at the University of North Carolina and Duke University. Though he currently lives in North Carolina, he will return to Gaza after completing his program. In an interview with UNRWA USA, Mohammed shares with us what it is like to grow up in the Gaza Strip and to come closer to realizing his dreams through higher education. He says UNRWA was there every step of the way, giving him hope, and he when he returns to Gaza, he plans on taking his knowledge to better the humanitarian system that allowed him and his family to survive. [UNRWA USA]: What was it like to grow up as a refugee in the Gaza Strip? [Mohammed]: I grew up in a 200-square-foot house, with five siblings and our parents in Rafah Camp in Gaza. The street was my living room, my study area, and where I played. As a child, I had never seen a baseball field, a swimming pool, or the cinema. [UNRWA USA]: How was UNRWA present in your life? Could you share some memories from your childhood related to UNRWA's food assistance program, in particular? [Mohammed]: I remember the excitement I felt as a child when my father returned home from the United Nations Relief and Works Agency Social Service and Supply Center with our family’s monthly assistance package. He would be carrying heavy bags, and the sense of relief I felt that we once again had food and medicine made me hug his legs until he nearly toppled over. I still remember that package, stocked with oil, flour, lentils, rice, and sugar. On that day, my mom would bake bread, and we would dunk it in sweetened tea. Sugar was a privilege and we were only allowed it once a week. My father always offered bread slices to the rest of the family before taking his share. Those days when we received our food package always felt lighter than other days. We sat at the table together as a family for a long time, our stomachs full and our daily anxiety lifted – at least for the time being. I dipped my bread all the way down to the bottom of my tea, soaking it completely until the tea was dripping all over my hand. My mom would get upset, but I would look at my dad, and he would just smile. [UNRWA USA]: You are currently in the US studying for a dual master's degree. Clearly, education has been an important part of your life for some time. Can you share with us what it was like to go to school in Gaza and how you see education as a lifeline? [Mohammed]: For nine years, I attended a local school for refugees run by UNRWA. The building consisted of a few classrooms built from corrugated metal; it was freezing cold in winter, scorching hot in summer. I studied English and learned computer skills without access to an actual computer. Music and physical education would have been a luxury. I liked my school a lot. Teachers used games to teach us and encouraged us to build teams. I felt a strong sense of belonging. I felt the teachers really cared about us. My life changed when UNRWA offered my father a teaching job with a monthly salary of $400. Because of that job, my father was able to send me to Al-Azhar University in Gaza City. I had the choice to study anything I wanted, and I chose English language because I wanted to be able to communicate with people around the world. Upon graduation, I joined 1,800 other Palestinians in applying for an UNRWA job program and was one of just 110 to be accepted. 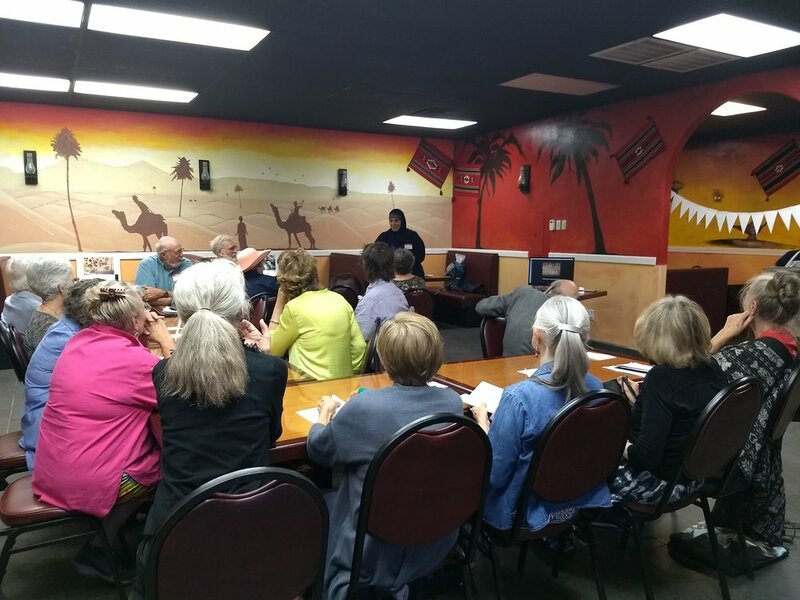 Mohammed speaking at a Rotary meeting in the US in 2017. He is in the US studying for his master's degree through a Rotary Fellowship. [UNRWA USA]: During the 2014 Israeli military assault in Gaza, you went from receiving UNRWA food assistance to being one of those delivering it. Can you tell us about that experience? [Mohammed]: During the 2014 Israel military assault on Gaza, I joined UNRWA’s emergency response program. Our role was to evacuate civilians from the bombed areas and host them at refugee shelters run by UNRWA. We also provided emergency assistance to fellow refugees who were targeted by the random aerial bombings. Victims were civilians of all ages, and the bombing was indiscriminate. We even lost many UNRWA staff members while on duty. [UNRWA USA]: That's really tragic, and we're so sorry to hear of all you've been through. Can you share with us how this experience shaped your current educational and professional aspirations? [Mohammed]: After the assault ended, UNRWA invited many international experts to provide training courses and workshops to develop the staff response skills during the rise of conflict in Palestine. One of the international trainers admired my dedication and hard work and advised me to apply for a graduate fellowship he was familiar with in the United States. He promised to write a letter of recommendation on my behalf. I received that fellowship. Today I live in North Carolina where I am studying Global Studies and International Development through a joint program at the University of North Carolina and Duke University. My goal is to learn how to improve emergency response efforts for victims around the world. When I look in the mirror, I still see that same unkempt little boy from the camps I was growing up, I cannot forget that I made it so far due to the support of UNRWA humanitarian assistance. Today I’m here to carry on this mission, to research and study new ways to help and support crisis victims, to help bring their sufferings' to an end. [UNRWA USA]: As someone who is well versed with UNRWA's work, what is your message to Americans who do not have a sense of its impact and role in your life and the life of the average Palestine refugee in Gaza? [Mohammed]: I’m proud to have the chance to work with UNRWA, the largest humanitarian platform in the Middle East. If it wasn’t for UNRWA, children and women would starve to death. Young men would lose hope and get caught in a vicious circle of violence. A whole generation would grow up without proper education. For all of those, UNRWA is the only hope in that part of the world. Mohammed receiving a certificate of gratitude by Bo Schack, Director of UNRWA operations in Gaza Strip, due to his contributions to the agency. Support families like Mohammed's in the Gaza Strip, just as he did in 2014, by providing UNRWA food assistance. 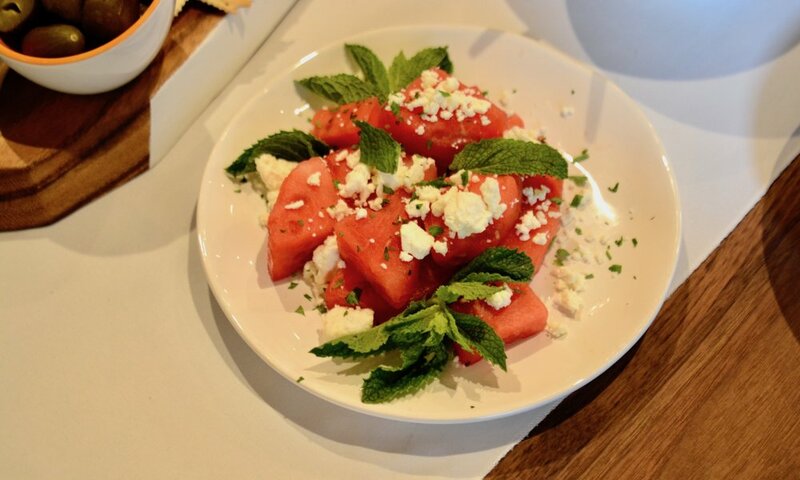 Host an Iftar for Gaza and feed more than just those around your table. For every $150 you raise, you can feed a refugee family -- like Mohammed's -- for the entire summer. Read other refugee stories and share their voices with others. In Beach Camp, west of Gaza City, lives 105-year-old Hakma Atallah in her two-room house with her 65 year old daughter Zainab. Hakma fled from her original village, Al-Swafeer, in 1948 when over 700,000 Palestinians were displaced during what is commonly referred to as al-Nakba (the Catastrophe). “Gaza, and particularly the Beach Camp, is where my family and I have been living for five generations. It is where all my grandchildren were born, got their degrees, married and had children. But it’s not like my original village, where I was born, spent my childhood and then got married. There, I had my own land where I used to plant grapes and raise cows and goats,” Hakma explains. 19 year old, Haneen Atallah, Hakma’s grandchild said: “Every day the family gathers around my grandmother and asks her to talk with us about Al-Swafeer. She used to tell us about the calm nights and nice weather there. She talks with us about the Nakba day and how the family fled from one village to another until they finally reached Gaza where they stayed in tents. I really can’t imagine how difficult these days must have been." We often like to highlight the first time we do something for its novelty and excitement. But there's something to be celebrated about doing something a second time, as it reminds us that what we chose to do has more than a one-time value. For UNRWA USA and Christy Boise, it's been a year of "seconds." It is the second time our organization has offered the Iftar for Gaza campaign, a social gathering that helps put food on the table for Palestine refugees in the Gaza Strip, and it's the second time Christy and the students of Coney Island Prep High School in New York have decided to participate. Christy is an educator at Coney Island Prep, where she is also the French Department Chair and advisor to the Middle Eastern Students Association (MESA). 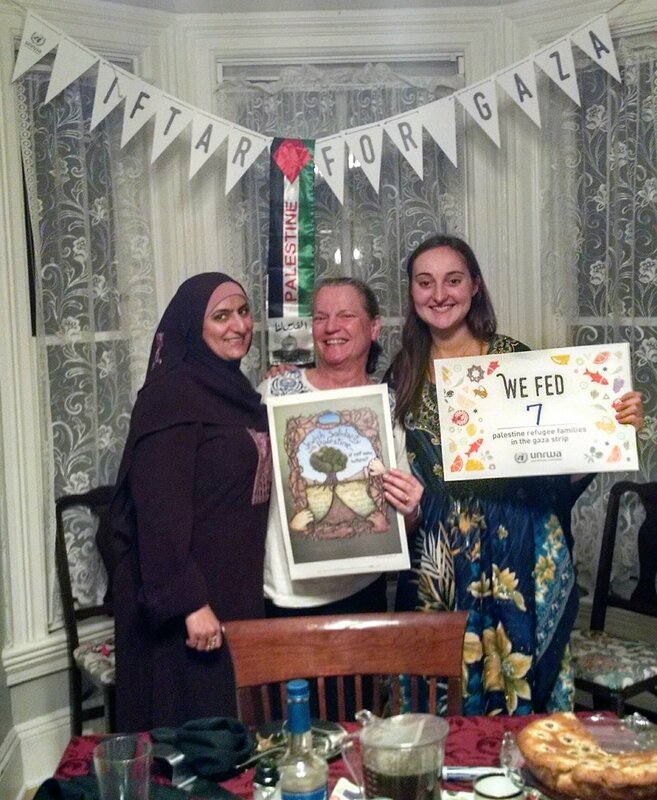 Recently, she shared with us what compelled her school to host an Iftar for Gaza event last year and why she and her students are making it a tradition and coming together -- for a second year -- to host an iftar to support Palestine refugees in the Gaza Strip. [UNRWA USA]: How did you hear about UNRWA USA and in particular, Iftar for Gaza? [Christy]: My heritage is Jordanian and I'm familiar with and passionate about the situation in Palestine and for Palestine refugees. This is a really important cause to me. One thing I love about UNRWA is that such a high percentage of donations go directly to refugees. Also, the organization employs such a large number of refugees, so you know when you're giving you're creating a sustainable impact that's helping people in multiple ways. 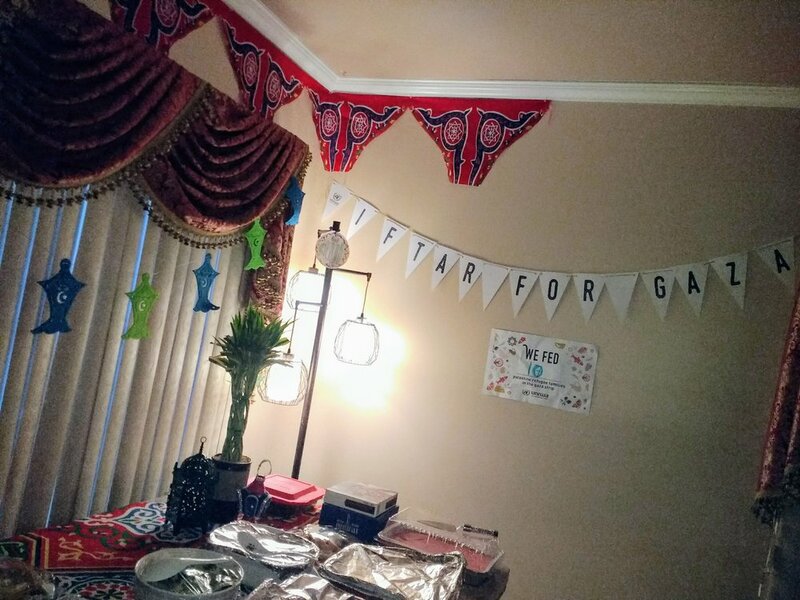 I've participated in the NYC Gaza 5K and got really excited when I saw the announcement for Iftar for Gaza and decided that we definitely needed to host one at our school! I advise the Middle Eastern Students Association (MESA) at Coney Island Prep, and we have some fantastic student leaders who took initiative and made the event the success it was. Yasmeen, a student who has now graduated, spearheaded the effort and was very excited about bringing together students of various backgrounds to start up important conversations about Ramadan, multiculturalism, and the situation for refugees in the Gaza Strip. [UNRWA USA]: Why did MESA decide to host an iftar last year, what made you want to participate again, and what do you hope for this year's event? [Christy]: We like helping other people and try to have at least one service project each year. Something really cool about our school is that it is very diverse and we have students from a number of different nationalities in our club. It's especially nice to plan an activity in which we can bring families and community members from our school together around the dinner table! There is something about bringing people together around food that makes people open up in a way that is sometimes impossible in other situations. Any time you can have an event that is helping other people and also brings communities, families, students, parents, and staff together around food is something that I see great value in and find deeply powerful. I've seen how the act of tasting food from a different place has the ability to transport a person to another culture and open their mind to something new in an authentic way. 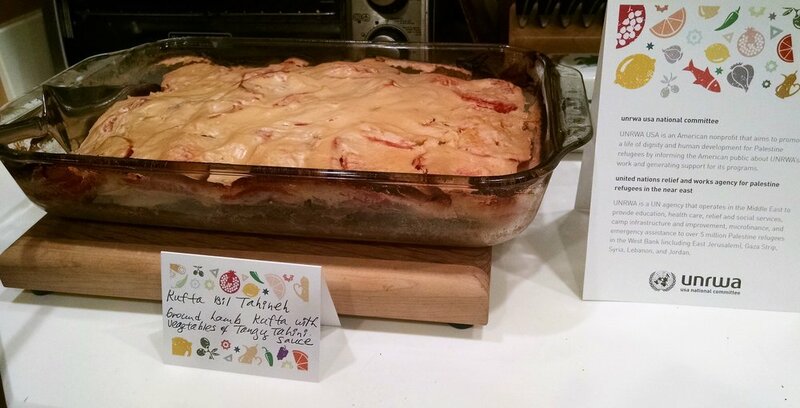 Last year, we had students from the Middle East bring their families' traditional recipes. One student told her friends that she would be bringing her mom's homemade knafeh, many students came to the iftar explicitly to taste a bit of her family's culture and home! This year we are hoping to continue this tradition of raising awareness about the plight of Palestine refugees in the Middle East and have an even bigger and better turn out! [UNRWA USA]: What do you think the biggest benefit of this event or takeaway was for your students? How do you think this event will impact them beyond the classroom? 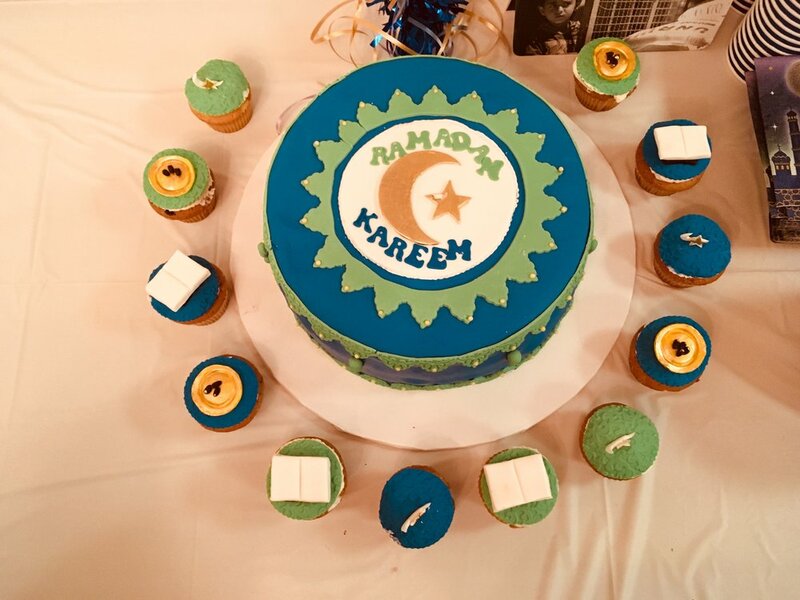 We have a big African-American student population with families who have been in the US for a long time but do not necessarily have a strong connection to the Middle East, refugees, or the cultural significance behind Ramadan. It was wonderful for our Middle Eastern and South Asian students to be able to share their views and perspectives and teach their fellow classmates about an issue that is not usually taught in the classroom but is one they are passionate about. Together, we discussed what it means to be from a different background, the value of helping other people, especially those in need, and the issues facing refugees. These types of topics are not the focus inside most traditional classes, so this event gave our club the opportunity to talk about these issues and learn from each other -- something I think all the students will carry with them for a long time. [UNRWA USA]: Can you share with us some memorable moments from last year's event? [Christy]: We had a much bigger turnout than expected and earned far more than we had hoped! During the school day, we made a special presentation during our Community Meeting (a whole-school assembly) and at the event, students spoke and shared why we were holding the Iftar, what Ramadan means to them, and why it's important to help those in Gaza who are suffering due to years of blockade and oppression. Some of the most memorable moments stemmed from the conversations students had. The Dean of Students asked the students to take three minutes to ponder the conversation topics provided by UNRWA USA in the Iftar for Gaza hosting kit along with discussion questions students created independently. Then, teachers walked around the room to assist students in creating thoughtful and productive conversation. The table topics from the kit were placed on the table for students to reference. We called on some students to share their thoughts, and I remember some of them were very profound, mature, and enlightening! This sharing of thoughts and experiences in our communal discussion made our Iftar that much more meaningful! 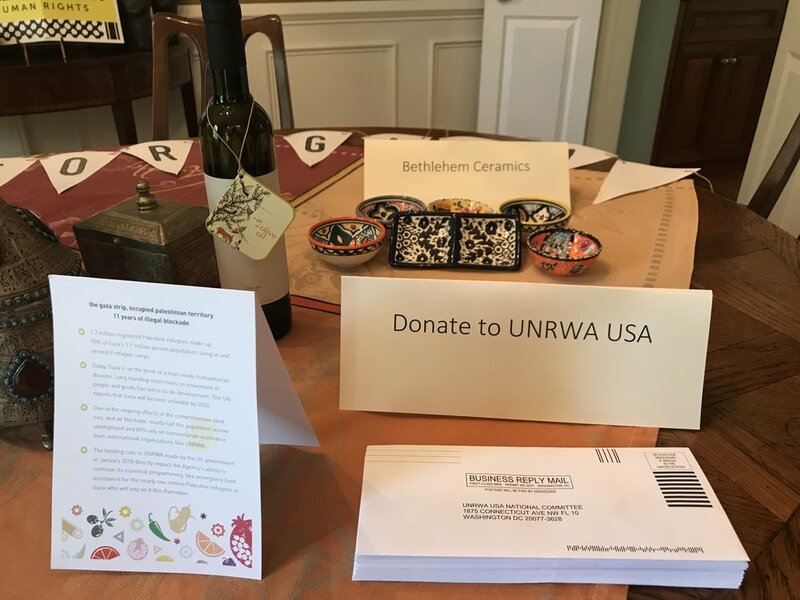 [UNRWA USA] Tell us about your fundraising. How did you promote the event and the cause? [Christy]: Before the event, two student leaders, Yosef and Mohamed designed new t-shirts for MESA. Though we have a school uniform, we had a special dress down day so students could wear their MESA shirts and raise awareness about the club and our event. We had student-designed posters around the school announcing the iftar, as well. Earlier in the year, we also held a bake sale that raised funds for MESA to put on events like this one! [UNRWA USA]: As an educator, what is a lesson you share with your students about the situation facing Palestine refugees that you'd like to share with students across America? [Christy]: I try to share that it's important to recognize stereotypes and look beyond them. I often point out the (mis-)use of Palestinians, Arabs, and refugees, in general, in media, in the movies and on TV. I also share firsthand information about my experiences with Palestinian friends living in Jordan. The first time I participated in the Gaza 5K, I shared some infographics to connect issues of loss and tragedy that refugees face and how that intersects with issues here in the United States. I believe there is a lot more that connects us than divides us, and it is important to have these kinds of conversations to lay the groundwork for better understanding of other people's perspectives and struggles. [UNRWA USA]: A large part of UNRWA's work is providing free education to Palestine refugees in the Middle East. Why do you believe education is important -- not just here in the US but around the world? [Christy]: Education provides hope for a better future for children around the world. MESA strongly believes in the UN Declaration of Human Rights that everyone should have an equal opportunity for education, whether they are a student in the US or a refugee in the Middle East. Iftar for Gaza was a way to start a dialogue and take advantage of the beautifully diverse and multicultural environment we have at our school. There's no age limit to learning and there's so much value in hearing from people of various backgrounds and experiences. At the event, it wasn't just the students who were learning, but it was an opportunity for the school's staff (who were unfamiliar with the Middle East, refugees, UNRWA, and Ramadan) to see things differently, create dialogue on what is happening in the Middle East, and open people's minds to seeing things differently, more accurately, and more fully! [UNRWA USA]: Do you plan on hosting for a third year? [Christy]: Yes, absolutely! We're calling this year's event the 'second annual Iftar for Gaza' with the hope that it's a tradition we'll continue every year! It's such an important cause and it was a successful, fun, and engaging event at our school, so I encourage other high schools in the US to participate as well! Inspired by Christy and the students at Coney Island Prep? Get details on how to host your own #IftarforGaza this Ramadan, including how to set up your fundraising page and download a copy of our free hosting guide! The UNRWA USA board of directors announced that after 8 years of dedicated service and outstanding leadership as the chair, Ambassador (ret.) Philip C. Wilcox, Jr. has been appointed chair emeritus. The board elected Ghassan Salameh as the new chair, succeeding Ambassador Wilcox in that role. Though Ghassan has been a member of the UNRWA USA board for six years, his connection with UNRWA runs far deeper. Recently, Ghassan spent time with our staff to share more of his personal story. Ghassan’s family was one of the tens of thousands of Palestinian families dispossessed from their home and made refugees during the Nakba in 1948. His family fled to Lebanon, and like many Palestinian families faced years of very difficult conditions. The early years were especially hard, extended family members squeezed together in one room and struggled to make a living. His family's problems were further exacerbated by his father's tragic accident, leaving him blind and unable to work. Under these challenges circumstances, UNRWA served as his family's lifeline. UNRWA provided a monthly allotment of food, healthcare services, and most importantly, an education. For his elementary and middle school years, he attended UNRWA's Carmel School in Al Hadath, a suburb of Beirut, Lebanon. Many of the students at his school were bused from the neighboring Palestinian refugee camps. He graduated in 1968, followed by high school at the Vatican sponsored Pontifical Mission for Palestine refugees in Dbayeh refugee camp. His last year of high school, he attended the Lebanese Evangelical School for Boys. "My formative memories from my childhood years all come back to UNRWA and the critical role it played in our lives,” reflects Ghassan. "My family is successful today because of what UNRWA did for us then when we had no one else. My three brothers and I are all UNRWA graduates. Without UNRWA, people like me wouldn’t be where they are." And though 'where they are,' physically translates to scattered across the world, Ghassan and his former UNRWA classmates still remain in touch. From Australia to Canada to the Middle East, they remain connected through a Facebook group where they update each other on recent events, share photos, and reflect on childhood memories. Each year, they hold a reunion, and this year, more than a dozen of them came together in Las Vegas, Nevada. While they say what happens in Vegas stays there, Ghassan couldn’t help but share his happiness in the opportunity to see old friends. He said what was most rewarding was to see all of his UNRWA classmates now, successful within their own fields, and with families of their own. He proudly commented that the emphasis on the importance of education was a value they all passed on to their children. Ghassan came to the United States when he was 20 years old and received his BS in Mechanical Engineering from the California State University-Sacramento and an MBA, focusing on marketing and finance, from the University of San Francisco. From there, he rose through the ranks of Booz Allen from Associate to the coveted position of Senior Partner. Since retiring from Booz Allen, he has held senior management positions at top global companies and is currently the Chairman and CEO of Rubix Holdings, a technology and investment company that has just launched its first two global social media platforms, with more on the way. The embodiment of the ‘American dream,’ Ghassan is thoughtful and soft-spoken. He credits his success to his family, UNRWA, and many other people and institutions who helped him along the way. Consequently, he has dedicated much of his time, energy, and resources, to giving back to those who supported him and especially to the Palestinian community with a dual focus on education and health. Ghassan has done so through his work as an UNRWA USA board member since 2012 and most recently, through an upcoming campaign and fundraiser through the Bethlehem University Foundation entitled "The Way to Bethlehem.” On May 15, 2018, Ghassan will embark on a 40-day pilgrimage along the Camino de Santiago de Compostella, as a way to raise awareness for Bethlehem University, draw attention to the issues of freedom of movement facing Palestinians, and highlight the importance of access to education. Ghassan's impressive business background and personal connection with UNRWA provide greater insight to our work. His service to the board has and will continue to be instrumental to UNRWA USA's growth. We look forward to the continued guidance and leadership Ghassan will provide our board and staff as we continue to grow as an organization in our pursuit of improving the lives of Palestine refugees. Dr. Basel Yanes was born in Beit Dajan, a village outside of Yaffa, Palestine, in 1947. In 1948, his family, like over 750,000 Palestinians, were forced to flee their home and become refugees. Displaced, his family left for Syria, and Dr. Yanes grew up in Damascus, where, as a newborn he joined other refugees who had lost everything upon leaving Palestine. Syria was markedly different in his youth -- unimaginable to most given the destruction and horrors that have grasped the country since the start of the civil war in 2011. He recalls Damascus wistfully, recalling it was a "quaint cultural city with good universities having a drastically smaller population of around 500,000." His father was able to get a job within two years at UNRWA, and ultimately rose through the ranks to become the Director of the Southern District in Syria. While his family did not live in the refugee camps, he had many friends and family that did in Syria. He clearly recalls a center run by UNRWA that distributed lunches to Palestine refugees and remembers as a child standing in line eager for daily rations. Soon after his father was employed by UNRWA, he was bringing home an income that covered their family’s basic necessities. Upon finishing high school at the free public school, Dr. Yanes (then, just Basel) applied and received an UNRWA scholarship to attend university and medical school. “If I didn’t have the UNRWA scholarship, I wouldn’t have been able to go to school at the University of Damascus and be where I am today,” he confidently states. After medical school, Dr. Yanes went to the US to complete residency at Miami Valley Hospital in Dayton, Ohio, and then went on to do a fellowship in hematology and oncology at Ohio State University Hospital. He completed his fellowship in 1976 and has called Dayton, Ohio home since then. This is exemplified by his impressive contributions to the medical field and his Ohio community. He has and continues to work in private practice and is president of the DBA Dayton Blood and Cancer Center in Dayton. In the past, he served as the President of the Medical Oncology Hematology Associates, and today he imparts his wisdom and knowledge to others by teaching as a Clinical Professor at Wright State University. While much of Dr. Yanes’s extended family is dispersed around the world, following the start of the war in Syria, stateside, he is the proud father of three children and grandfather to one girl, all of whom live in various cities in the US. Team Superheroes for Gaza at the 2017 NYC Gaza 5K assembled in hero formation! New York City's superheroes showing Palestine refugees Americans care! Our caped and masked crusaders for mental health! Thank you to these superheroes for showing Palestine refugees that Americans care. Your commitment year after year to this cause is inspiring and we can't wait to see how you all dress, run, and save the day at next year's race. This year's NYC Gaza 5K was described by participants as 'the most lit 5K' they have ever run. In addition to this absolutely flattering -- in a truly millennial sense -- comment, the UNRWA USA team has received such wonderful feedback from the event and we are so grateful. But ultimately, beyond the run, dabke, and logistics on our end, the success of the event was a reflection of the amazing New York community that came together to support the children of Gaza, raising more than $355,000 for mental health services and UNRWA programming. One such group of participants was the members of Team Warek Dawali. They not only made this event an important enriching, communal experience but also had four team members to medal in the race! Their team was passionate and energetic, collectively raising $6,447.13 -- surpassing their fundraising goal by nearly $500. Four members of team Warek Dawali placed either overall or within their age divisions; team captain Izzeldeen Farraj came in third place overall! We are honored and humbled by these words of kindness and the generosity of the New York community. 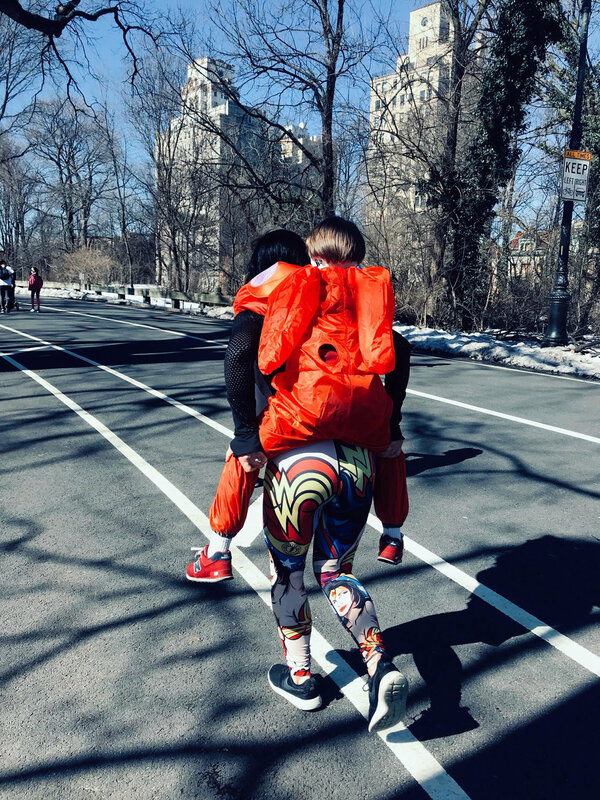 A huge thank you to the Farraj family, team Warek Dawali, and all the other incredible teams that moved for mental health with us in Prospect Park, Brooklyn on Saturday March 24. Stay tuned for future race dates and other UNRWA USA activities in your community! [UNRWA USA]: Why is your team fundraising for the kids in Gaza? [Team Hi Guys]: To share why we are fundraising, we need to go back to the story of our family, our connection to UNRWA, and how this race -- even up to the name of our team -- is a testament to my father, Ziad. This is our story. Have you ever imagined Super Mario without his mustache, hopping off the stacks of cinder-blocks arranged into buildings, banging on corrugated tin roofs with a tightly wrapped sandwich in his left fist and a stick in his right? That's Ziad at 7 years old. Except maybe he had a mustache then, too. Ziad is our dad -- or Ammo Ziad (Uncle Ziad) to you! His family was exiled from Palestine, and so our dad was born in Lebanon. But try as you might, you'd never find a paper from Lebanese authorities claiming that little baby with milk in his mustache as their own. In exile, in his camp of birth, you know who claimed him? UNRWA. UNRWA is a vital lifeline for over 5 million registered Palestine refugees in Lebanon, Jordan, Syria, the West Bank, including East Jerusalem, and the Gaza Strip. Refugees unto their fourth or fifth generation depend on UNRWA for their life and livelihood. Many are stateless and depend on UNRWA for the services a state would provide: school, health, job support, vocational training, and public services. More than 70% of Gaza's residents -- 1.4 million people -- are Palestine refugees. UNRWA serves all of these people, more than half of them kids, little Ziads. 261 schools, 271,900 students, and hundreds of health clinics, providing vital life- and mind-saving services in the face of aggression, oppression, and brutal occupation. So when President Trump withheld $300 million from UNRWA's operating budget, it directly affected this generation of Ziads. In true Ammo Ziad fashion, he responded to this decision with cheek and self-assurance, and said exactly what we'd expect: Hi, guys. [UNRWA USA]: Why is mental health an important issue to your team? [Team Hi Guys]: Camps like Ziad's haven't disappeared. They've only grown. They're still in Lebanon, in Syria, in Jordan, the West Bank and in the Gaza Strip too. And while Ziad may have gotten out of the camps where he grew up, there are so many little Ziads running around the camps, catching pigeons and torturing their teachers. And in Gaza, those kids are also dealing with the aftermath of regular Israeli military assaults -- not just because almost 70% of Gaza's population are refugees, but because Israel's frequent assaults on Gaza have imposed a serious impact on kids who wet their beds in fear, kids whose classmates have disappeared, kids who live with ongoing PTSD, which makes getting by day to day a reality that you and I probably can't comprehend. [UNRWA USA]: Do you have a message you'd like to share with your fundraising competitors? [Team Hi Guys]: Eat our dust, guys.